Exhibition OSU Cascade BFA Student Art under Sandy Brooke, Associate Professor of Art. 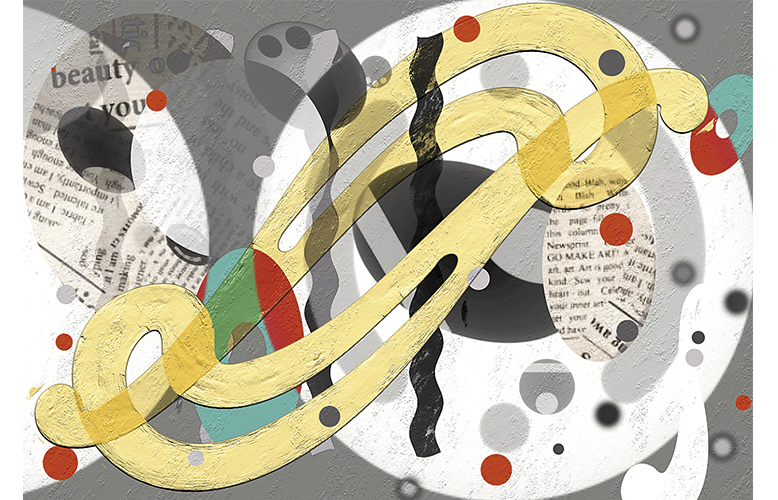 The OSU Cascades bachelor of fine arts student show will include graduating seniors Kurt Armstrong, Sarah Fisher, Olivia Haro, Angelia Newstrand, Cindee O’Connor, Michael Peterson and Mary Schellert. Their work will range from enhanced, digitally manipulated photos, acrylic and oil paintings to digital paintings. The BFA juniors, 2016 graduates, will also show work Matthew Luke Allee, Robert James, David Ray, Nancy Richmond, and Diane Schroeder as well as Graduate Robert Henderson. Noi Thai serves wine and Thai appetizers and the Tommy Leroy Trio performs jazz for First Friday. Billye Turner, art consultant, 503-780-2828 or billyeturner@bendnet.com, organizes exhibitions for Franklin Crossing. 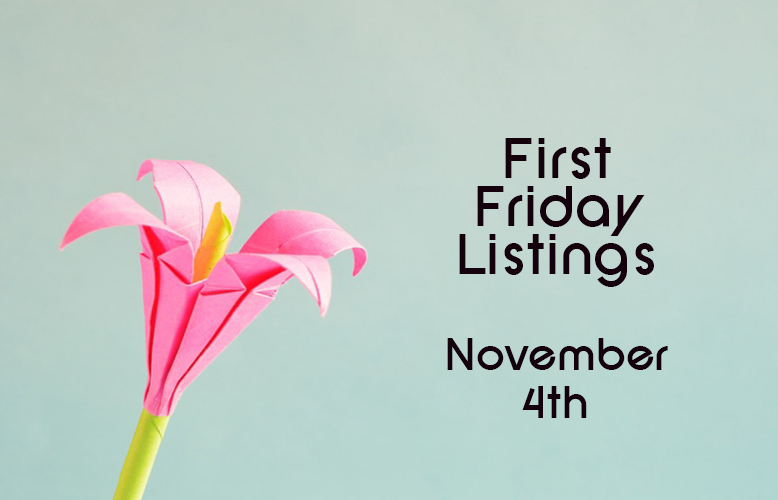 313 SW Shevlin Hixon Dr.
First Friday with a family-friendly activity at the Art Station! Kids and adults can get creative with a self-guided art activity with one of our instructors. Special morning sessions from 10am-12pm are perfect for homeschoolers. Evening sessions from 4-6pm offer art making in one studio, and adult refreshments in the other! Adults, please accompany youth under 18 at all times. The A6 Collection, features contemporary prints and hand-made books from the Atelier’s private collection. The public can view work from high-profile artists such as Francoise Gilot, Joseph Mugnaini, Robert Rauschenberg, Rick Bartow, Bob Nugent, Gendron Jensen and Adrian Van Suchtelen. 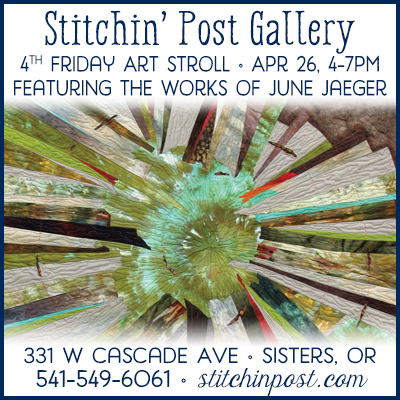 Local artists Ingrid Lustig, Patty Freeman-Martin, Justyn Livingston, Ron Schultz and Nancy Dasen are also featured. “Most of the pieces in this collection were donated by the artists,” explains Dawn Boone, A6’s executive director. “We use this collection as an educational tool to show the breadth of printmaking and book arts.” The collection includes monotypes, collagraphs, lithographs, etchings, artist books and fine-press books. A6 founder Patricia Clark will give an Art Talk, A Tour of the A6 Collection, on Friday, June 12 at 6pm. The talk is free; A6 suggests a $5 donation per attendee. Featuring Azillion Bead’s jewelry artists. Featuring western life and landscape photographer, Linda Ziegenhagen. A retired teacher and Oregon native, Linda blends her love for outdoors and traveling with natural ability as a photographer. Join us at First Friday Art Walk for a night of great food, drinks and amazing art. Featuring live music and art from Visions of Hope. Visions of Hope Art Program benefits the Otino Waa Childrens Orphanage in Uganda with art from prisoners of the correctional facility of Oregon. Please join us and support this worthy cause. Old Mill District, 330 SW Powerhouse Dr. Featuring Bend watercolorist Sarah Hansen who brings a human connection to Central Oregon surroundings by bringing beauty, hope and life’s chaos into extraordinary paintings. 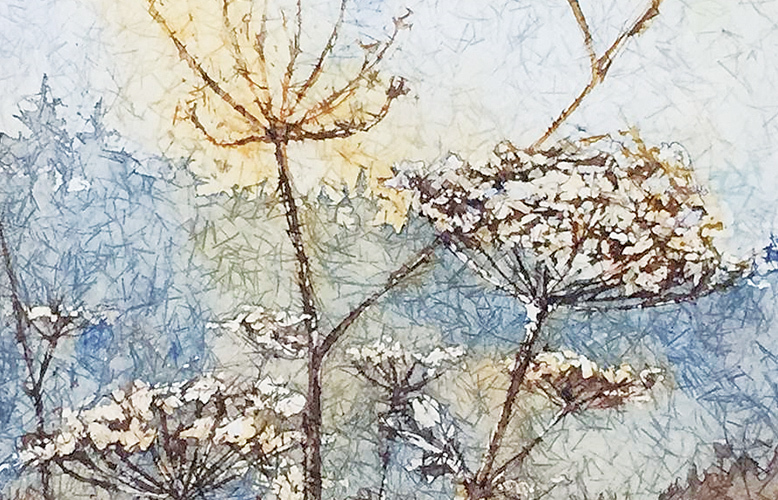 Hansen’s award winning art is gaining widespread notoriety as she explores her new technique of painting watercolors on up-cycled Plexiglas. Meet Sarah and see her latest collection of paintings, prints, and cards as she joins Cascade A&E to celebrate 20 years at First Friday, July 3. 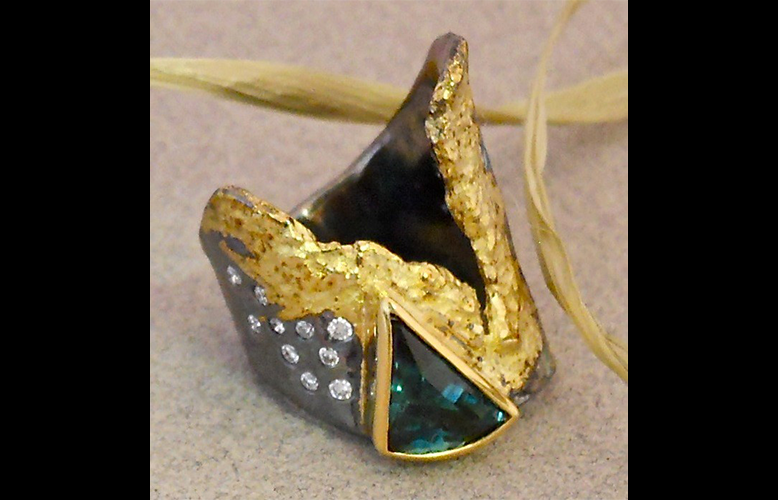 Wearable art by Central Oregon’s newest national award winning jewelry designers, Elyse and Steven Douglas of Douglas Jewelry Design, along with monthly rotating work by local guest artists such as Betsy Bland. Deeply involved with the Oregon Sunstone from mining to finished work, Elyse and Steven combine 33 years of collaboration and a passion for wearable art to bring you jewelry that is beautiful, personal and expressive. Many new artists to share with you all. Hope to see you for First Friday. Landscape photography by Jeffrey Murray from local and national locations. Karen Bandy is Central Oregon’s only national/international award-winning jewelry designer, specializing in custom design in downtown Bend since 1987. Her designs are bold, fun and always very wearable. Bandy is also an abstract acrylic painter whose work is described as colorful and textural contemporary fine art. When there is an actual subject, horses and wild animals are often depicted. Open Tues., Wed., Thurs., 11:30am-5pm and by appointment and First Fridays. The Lubbesmeyer twins offer a range of work created in fiber and paint. Through the twins’ collaborative process, they distill literal imagery into vivid blocks of color and texture, creating an abstracted view of their surroundings. Working studio/ gallery open Tuesday thru Saturday. Mary Medrano shows her newest figurative works and dog paintings. Her work has been shown in the U.S. and Italy with several solo shows in California including John Natsoulas Gallery in Davis and Gallery Blu in Santa Clara, Ameriprise Financial in San José, Bank of America in Sunnyvale and Maturango Museum in Ridgecrest. Four Seasons, a two-person exhibition with Angela Mia De La Vega and Romona Youngquist. View Angela’s new bronze sculptures as well as Romona’s new oil paintings. Meet the artists, sip a glass of wine and listen to Rich Hurdle and Friends. Technically self-taught, Romona credits nature as one of her most valuable teachers. She explored the woods in rural Oklahoma growing up and found herself immersed in the designs and colors of nature. She then rushed home to draw what she had seen. De La Vega’s ability to sculpt the human form in clay and give it life is a marvel to behold. She sculpts her deeply honest observations, reflecting even the smallest nuance in character and ultimately revealing an acute, mesmerizing likeness to her model. The clay is then transformed into elegant figurative bronze sculptures. Mixed media paintings by Mary Medrano thru June 24. Medrano, a BFA graduate of Western Michigan University with certification in graphic design and visual communications from UC Santa Cruz, notes that painting is her favorite way to express her thoughts and emotions. Inspired by the natural world, she chooses birds finding that their unique personalities and behaviors lend them to interpretation. The artist’s work is largely autobiographical, from her subconscious. For her current series, she borrowed the shape of the Black-Eyed Junco, the California Quail and a few fictional birds to represent her joy at living in Central Oregon. Beginning with the end in mind, she visually explores combinations of paint, textures, words and lines. The artist both applies and subtracts color, sands the surface, adds lines with graphite or ink, collages fabric and draws with oil pastels and colored pencils. “It’s a give and take process until I am satisfied with the results,” says Medrano. Her art has shown in numerous California galleries including the Maturango Museum in Ridgecrest. In 2007 jurors (art critics and historians) selected her work for the Florence Biennale in Italy. Pat Clark, master printmaker and founder of Atelier 6000, exhibits six decades of personal sketchbooks. Each volume contains studies of line and shape that inform the imagery she uses in her finished drawings, prints and paintings–examples of boxed landscapes, “combines” that explore indistinct margins between art and the everyday world and investigations of natural elements like water, rocks and roots and how they interact in landscape and architecture. Bend artist Ron Schultz exhibits an exploratory series on time and its influence on people and objects. Schultz combines encaustic painting, drawing and book inspired assemblages with variety of other materials–industrial stains, varnishes, pigments, copper and metal patina methods and incorporates the collage of handmade and exotic papers and natural fibers and found items that give his work a physical and textural quality. Grace Grinnell will be the featured quilter. The Notable Women Quilt Initiative will share 32 quilts from women in history. painting could be called spontaneous or “in the moment.” She exaggerates the colors allowing her to manipulate the reality and create a more spontaneous, and sometimes whimsical feeling to the painting. 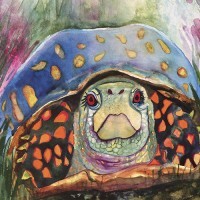 Jacqueline Newbold teaches watercolor and art journaling classes all over the world. She has created a DVD for Interweave Workshops called Art Journals On-The-Go: How to pack, prep, paint and more. Jacqueline has published a book titled Watercolor Journeys that is full of helpful information for beginning to advanced watercolor enthusiasts. She often has articles and artwork in publications such as Somerset Studio’s Art Journaling, Interweaves Press’s Cloth Paper Scissors and Studio’s. She also creates jewelry that is sparkling and a delight to wear. Joanie Callen is a mosaic artist with a love of color, especially strong saturated colors that dominate her work. She studied classical mosaics in Ravenna, Italy that inspired her own technique of a modern translation of the Byzantine method of setting tesserae (pieces of glass) directly into a mortar bed. Joanie’s latest challenge has been to incorporate fused glass into her pieces, this has resulted in beautiful fused glass buttons, flowers, stars and various fanciful shapes used to accentuate her creatures and functional mirror art. Featuring artist Kathleen Keliher. Since her move back from Portland last year, Keliher has been painting steadily in her studio in Sisters and on location in the Central Oregon area. Working in both pastels and oils, she continues to develop beautiful landscapes for which she is known. “I think there will be a shift in my painting this year. I’m very focused on the plein air aspects, and find myself out in the field at least two to three days a week. I think it will definitely influence my studio pieces.” Her show will feature an assortment of old and new images, from small plein air studies to larger studio works. MaryLea Harris paintings, and other visual art compositions, depict the silhouettes of trees caught in their transition between fall and winter. Donn Curry is a visual artist and poet originally from South Carolina. He graduated from Appalachian State University in 1996 with a BFA in painting and has exhibited his work in San Francisco and Portland. Although known for his painting, Curry has focused his artist eye with the aid of the lens of a camera to document and capture his love of nature and an affinity for the human spirit in this exhibition entitled Peace Book. Peace Book is a project whose initial premise was to be presented as a book of poetry and photography highlighting Curry’s four year excursion of travel while living in Asia. However, Curry has taken another path and is presenting his inspiration for living life to the best of his ability and to enjoy life to the fullest through a photographic exhibition. Mischelle Oberg and Nancy Misek. cornerstone of Susan’s work. Using shape, color and composition, these new paintings on cradled birch board take her interest in natural abstraction to a new and challenging level. From an island estuary to mountain lakes and wild rivers, Susan is drawn to water is all of its fluid poetry. Known for her depictions of native trout species in their underwater environment she was featured in the spring issue of H2O Magazine and provides artwork for Deschutes River Conservancy projects like Riverfeast and Tight Lines.